Young at Heart’s Lisa Mathews talks with great kid-friendly musicians. Early on in Young at Heart’s creation, I knew I wanted to talk to artists creating great music for everyone – especially young kids and old kids. My first interview was with Steve Burns of Blues Clues fame, and Steven Drodz of The Flaming Lips, and they epitomized what I call Adult Kids: musicians doing music for mostly adults and to varying degrees, kids. Steve and Steven had just released Foreverywhere, a wonderful CD with kids in mind that perfectly combined the clear voiced narration of Steve Burns and the lush musicality of Steven Drodz. The CD was one of a handful I had found that gave me hope that Young at Heart would be a worthwhile listen. I thanked my lucky radio stars and included them in the very first Young at Heart show March 4, 2017. It’s fitting that SteveNSteven was my first interview. Honestly, I was nervous, since both of these guys are stars in my eyes. I remember gushing to everyone at WTMD that I had just interviewed them, and they probably thought I was a crazy woman, flailing my hands and running around the offices. But I was just so excited. Since then, I’ve calmed down a bit and I absolutely enjoy talking with fellow musicians making music with kids in mind. Everyone has a different story to tell, a different idea of what makes great music for kids. 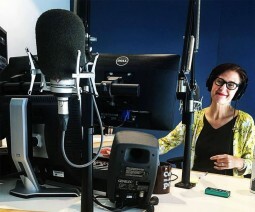 And talking to artists via phone or in the studio has been one of my great joys working here at WTMD. On this page, you’ll find the full interviews, along with pictures and videos. Enjoy!